57th National Schools’ Championships winners, District 10.
for the third consecutive year and 16th overall. District Ten also claimed top honours in the track and field arm. District 13 (South Georgetown), led by the tunes of their own band, were in extravagant jubilation as if they were the champions of “Nationals”, when it was announced that they had finished 2nd overall in the championships. 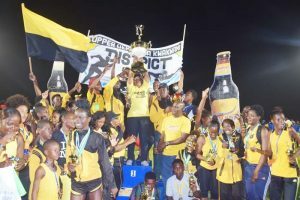 District three (West Demerara/Essequibo Islands) who won the Teachers’ Track and Field championships, finished third overall. In District 10’s victorious track and field campaign, Daniel Williams who broke the Under-18 boys’ 100m and 200m earlier in the week, set a new 400m to be the most outstanding in his age category, while Chantoba Bright was tied with Joanna Archer of District 3 for the Under-18 champion girl award. Williams, the World Youth Games 2018 400m silver medalist, was expected to rewrite the record books in the race and he came through after clocking 49.84s. The previous mark (49.9s) was set by Jason Yaw in 2013. Bright won the long, triple and high jump events, while finishing second behind co-Under-18 champion girl Joanna Archer in U-18 400m. Archer won the 400m, 800m and 1500m events. Anfernee Headecker performances were pivotal in helping District 13 finish second overall. Headecker, who was a beast in the penultimate day in the middle distance races in which he followed up his win in the 800m on day four to smash the boys Under-20 1500m record, was just as devastating in the 5000m. He ran tactically well, using his opponents to cut the breeze when running into the wind, while setting the pace when going with the wind. Fan favourite, Rickie Williams of District 11 couldn’t cope with the pace and had to be stretchered off the track. Another notable performance was by District four’s (East Coast Demerara) Angelina Barclay of President’s College who broke the girls’ Under-16 triple jump record when she hopped and skipped to 11.69m, as the District’s aim of leaving a lasting impression continued successfully. The previous record was 10.66 set in 2006 by Roxanne Rigby of District 15.